Posted in Brunch, Vegetarian, on August 28th, 2016. A Dutch Baby. Oh my. So delicious. This one with a layer of sliced apples that have been cooked with a bit of butter, cinnamon and brown sugar. Then the puff pancake mixture is poured in. Yes! It’s been years since I’d had one of these treasures. Years ago I used to go to a pancake house in Denver that had it on the menu. It was served plain, sprinkled with powdered sugar and a wedge of lemon to drizzle on top. I recall that I ordered it fairly often. Many years ago I tried to make one and my recollection is that it failed – it didn’t rise. It didn’t have that characteristic popover-type custardy tender texture. These things are also called a German pancake, a Bismarck, or a Dutch puff. Normally it’s made in a cast iron frying pan. According to Wikipedia, which cites Sunset magazine as its source, Dutch babies (by that name) were introduced in the early 1900s at a restaurant in Seattle, called Manca’s Café. 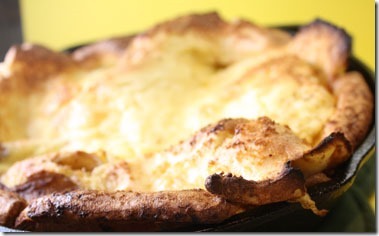 It was family run, and one of the daughters is said to have coined the name, Dutch Baby. 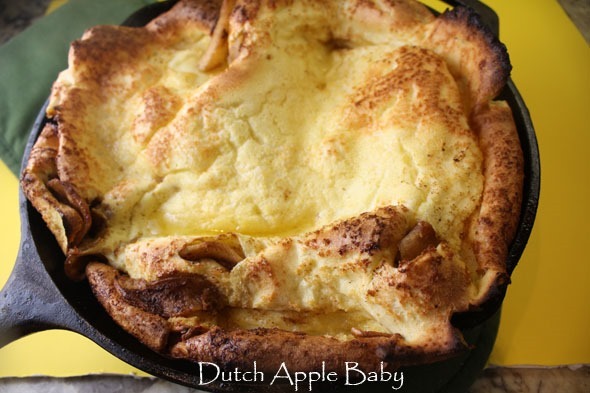 A few months ago I was reading someone’s facebook page and it contained one of those rip-roaring fast videos of how to make an apple Dutch baby. I watched it twice and determined then and there that I’d try making it again. So, a week or so later I went to my friend’s facebook page to watch it again, and it was gone. Huh? I emailed my friend and asked about it – she had no idea about any Dutch Baby video on her page. So I did some sleuthing – I couldn’t remember where it had come from, but I finally found it. I think – although I’m not certain about this, so don’t quote me – that if you ever DO allow one of these video sources to post a video on your facebook page, you have right then and there, agreed to let that source company post more videos to your facebook page without your knowledge. I finally found the video at tiphero. I’m not going to give you the link because if in fact that’s what they do, I don’t want to be spreading the problem. The recipe for this dish can be found at other places on the web. Making this recipe, the proportions and directions came from their website. According to Wikipedia, there is a formula, for every 1/4 cup flour, you need to have 1/4 cup milk – very similar to a popover batter. And for every 1/4 cup of those you need an egg. So, 3/4 cup flour, 3/4 cup milk and 3 eggs. The apple slices are cooked in a bit of butter, then removed. The pan is wiped clean (so the butter doesn’t burn) and you heat up the iron skillet in a 425°F oven for 8-10 minutes, so it’s literally smoking hot. Handle with care! Remove the pan, melt a bit more butter, pour in the apples, then pour in the batter. And back into that hot oven it goes for 18-20 minutes. Mine was done at 18. Again, I was very careful with it because that pan is really hot. I slipped the pancake out onto my serving plate, and I’m embarrassed to tell you that with the exception of about 3 bites, I ate the whole thing. It was my dinner. I relished and I mean relished every single bite! You don’t have to make it with apples – I just liked the idea of it. What’s GOOD: Oh gosh. I thought it was fabulous. But then I also love popovers, though I never make them. This was quite easy to do – just have everything ready when you start, and be prepared when it comes out of the oven to eat it immediately. No fiddling around with setting the table or pouring a glass of milk. No. Serve. Sit. Eat. What’s NOT: nothing at all – it was quite easy and was a special treat for me. Confectioners’ sugar and lemon wedges, if desired. NOTE: You must have an iron skillet – a 10″ one to make this dish. 1. Preheat the oven to 425° F (218 degrees Celsius). 2. In a medium bowl, whisk together the eggs, milk, flour and sugar until smooth. 3. In a 10-inch cast iron skillet over medium heat, melt the butter. Add the apple slices and sprinkle with the brown sugar and cinnamon. Cook for about 5 minutes, frequently tossing, until the apples are coated and have softened. Transfer to a dish. 4. Wipe the skillet with a paper towel and place in the preheated oven for about 8 to 10 minutes, until very hot. 5. Add the remaining butter to the skillet, swirling to coat the bottom and sides. Add the cooked apples to the center of the pan and pour the batter on top. 6. Bake for 18 to 20 minutes, until the pancake has puffed and the edges are golden brown. The center should be set but custardy. 7. Sprinkle with the confectioners’ sugar and serve immediately with a lemon wedge, if desired. Note: The pancake will lose its puff as it sits out, so be sure to prepare this one right before you want to eat it and enjoy as soon as it’d done! Have your table set, beverages poured, fork poised, and dig in while it’s piping hot. Per Serving: 664 Calories; 34g Fat (45.9% calories from fat); 18g Protein; 72g Carbohydrate; 3g Dietary Fiber; 393mg Cholesterol; 273mg Sodium. It’s a beauty, by the way! Your Dutch baby, I mean. I didn’t realize about the formula until you mentioned it, but I like recipes that can be cut down to one serving, especially ones where you don’t need to divide an egg. I make King Arthur Flour’s whole grain pancake mix to keep in the freezer, and I usually make myself just one serving (the guys aren’t crazy about whole grains). It takes half an egg, and I’m not sure what to do with it. If I save it in a jar, I forget to use it, and I like fried eggs, not scrambled, with my pancakes. I used to scramble it for my dog, but she’s gone now. Guess I should just make two servings and have pancakes two days in a row. That sounds like sweet Yorkshire Puddings! Same ingredients anyway. In Yorkshire, the pudding would be served first, with gravy, then the meat and veg and gravy then more pudding with Golden Syrup on it. Makes for a filling but cost effective meal for farmers with hearty appetites!